I've been using the TM Enhanced A5 layout most of 2012 and I've found it a very useful layout. Some weeks though I have noticed I'm not using the daily tasks space on a regular basis, so I thought that this valuable page space could be used for journal notes. They are created as A4 documents. To use them as A5 inserts, print the document in booklet mode on A4 paper, then use a guillotine to divide each sheet into two and punch the required holes, which the templates are set up with mirrored gutters to accommodate. Or, if you have A5 paper, then either the printer or the PC will scale it to size for you. When? - Sunday 6 January from 10am (US East Coast time), 3pm London time, 4 pm Paris time etc. See the clocks at the top of this post to see roughly what time you should be on line. Who - All of you... connect up with Philofaxy and we will attempt to get as many of us linked in to the audio conference as possible. Come and listen if you don't want to chat. Hope to be chatting with you on Sunday 6 January 2013. So I hope you had a good Christmas and you had a great time. Presents unwrapped, turkey eaten and some of you may have already visited the sales. So, did Santa bring you any Filofaxes? I am very grateful for my gifts, but I really wouldn't want someone to buy me one without discussing it with me first ("An Apex? Really, you shouldn't have"). My Mum-in-law very kindly gave me some money towards my A5 zipped Holborn. Here's to a wonderful 2013 for you all, and please feel free to discuss anything Filofax or ring bound organiser related. It's been a while since we've published a new layout, but this one was a special request. Ray and I often get requests from readers of Philofaxy and My Life All In One Place and usually we're happy to oblige, although because of the various other demands on our time it won't always be overnight. A reader who liked the Personal CC inspired layout asked if we could produce an A5 version. Well, of course we could. Additionally we also have a Personal size version of this layout on Personal Paper available. To print the document on Personal Paper you might find this help guide useful. Similarly if you wish to make your own alterations to the files you can download the Word Base file and the Excel data file (You will need both file). FAQ: This is a good place to look for the simple often asked questions. We try to up date it from time to time to reflect the current topical questions. All Stars: The Philofaxy All Stars... a group of readers who have done guest posts on each others blogs not all Filofax related, but a great read anyway. Flickr: An overview to the Philofaxy Flickr group where you can share pictures of your Filofax and there is a small discussion group there too. RSS - You can add Philofaxy to your favourite RSS reader such as Google Reader. 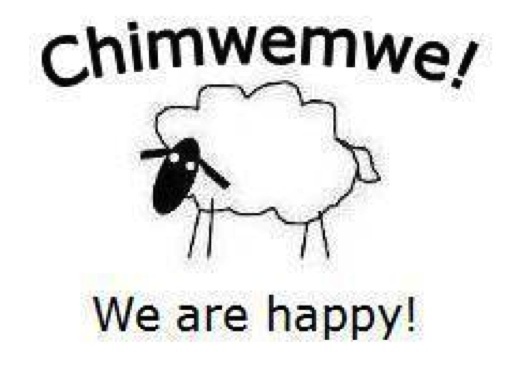 Google Plus, there is a new Philofaxy Community on Google Plus. You will also find a lot more links to our various activities on the web in this previous post. Skype Roundtable Voice and Text Chats - once a month we have a Skype voice conference, this is open to anybody to join in. It is an open agenda and we don't only get to talk about Filofax things. People taking part can be spread around the world, so it can be quite educational as well as good fun. Look out for announcements on the blog about when the next one will be. Generally they are the first Sunday of the month, but they can move slightly if this conflicts with public holidays or Steve's travel arrangements! Meet Ups - We have held several very successful meet ups, they vary in size from as little as two or three people up to twelve people, these have been held in London, New York, France, Holland, with other ones planned for other countries around the world. A Holborn in a Personal size. And a Holborn in a Personal size..
And no Alice Temperley's ... sorry Alice not even Santa could afford your prices! And that's how you can get 364 Filofax Organisers.... 1 on the first day, 3 on the second, 6 on the third day etc. How keen are you to escape from building models and repairing toys today? Steve wrote a great review about his brown one here which I enjoyed reading, and I found myself absent-mindedly stroking Saz's lovely wine A5 one at the Philofaxy meet up, so I knew I already liked them. I think the soft pliable leather and contrast stitching is what I also like about the Maldens. I've also realised that I can't fit everything into a personal sized filo and a zipped A5 is so handy for popping paperwork into, zipping it shut and it's ready to pick up to finish at a later time. I don't have a huge amount in it yet, but its main uses will be for reading and working on projects as I find personal size paper a bit small for planning and mind maps. I've realised that I'm now comfortable with owning more than one filo, so one personal and one A5 is going to be perfect for my needs in terms of both portability and extra writing space. My only slight concern is the gappy top two rings which have appeared as it's started lying flatter but they don't seem to have got worse and paper doesn't catch on it, so fingers crossed. 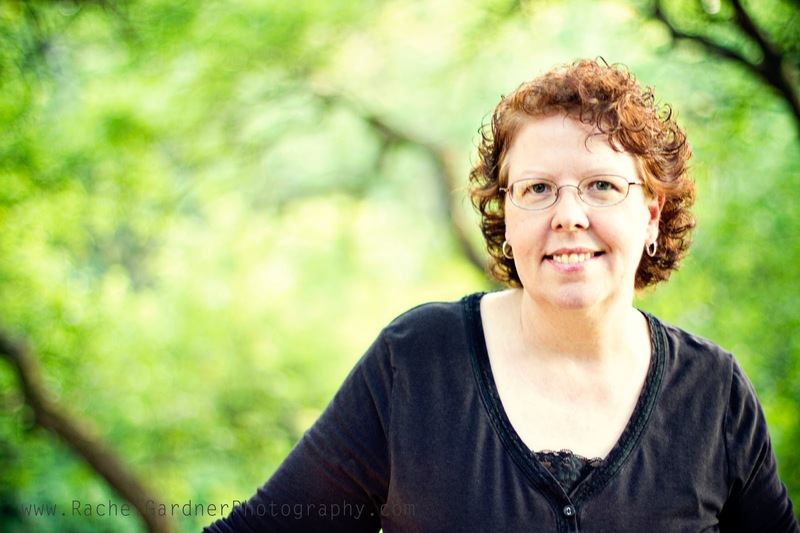 This week I would like to introduce you to Linda! Hi, I’m Linda, Originally from Los Angeles, I now live in Austin, Texas, with my husband, Ira. I have worked in many cities in the US-all in some way connected with being an accountant! Since my son is now grown and has his own place, I have plenty of time for all things Filofax. I don’t blog everyday-but when I do, my blog is on Google Blogger, under: "Mindloomer360"
Bought my first Filofax in 2008 - a pink zip Finsbury. That same year I added the black zipped one. I have a special place in my heart for calendars. They bring the promise of new chances, new projects, and new organizational Goals to be met.. I've used so many--Franklin-Covey, Coach, Day Runner, and Levenger's Circa System And I haven't even started listing all the electronic scheduling apps I have used-and there's been so many! My personal Black Ostrich, tied with the personal crimson Malden. Buying the Crimson Malden was an adventure for me; I couldn't get it here in the states, so I bought it from the Filofax online store in France! When I really want a particular Filofax, I will come up with a way a way to find exactly what I'm looking for! All sorts of things--some are for journaling, for recording medical matters, for schedules of medication, schedules of upcoming classic movies and upcoming reading lists. And the rest of them are merely for me---to pet, smell and look at. I take excellent care of each one of them--but haven't quite started naming them, as yet. The fact that customization was possible, and that there were lots of styles to choose from. I would first fix the problems some have with the plastic bubbling and bending on the classics; then refit them with a "jointed" section and ring protector, on either side of the rings. That appears to be one way the Finchleys, Decos and others could start out flat, right out of the box. Then I would have all of the models available in the UK and Europe, also available in the US. Ones that are customer favorites could be reordered as a "special order"
My A-5 stays at home; she never goes out, since I no longer work. The personals live on my nightstand or are carried in my purse. I really like the personal Ostrich and lizard, both in black, or red. I am in love with most all of the Finchleys, especially the red one. The crimson Malden is also a favorite. But the only one I WILL buy, if I can ever find it, is the discontinued personal, vintage pink Finchley, of course! 10. 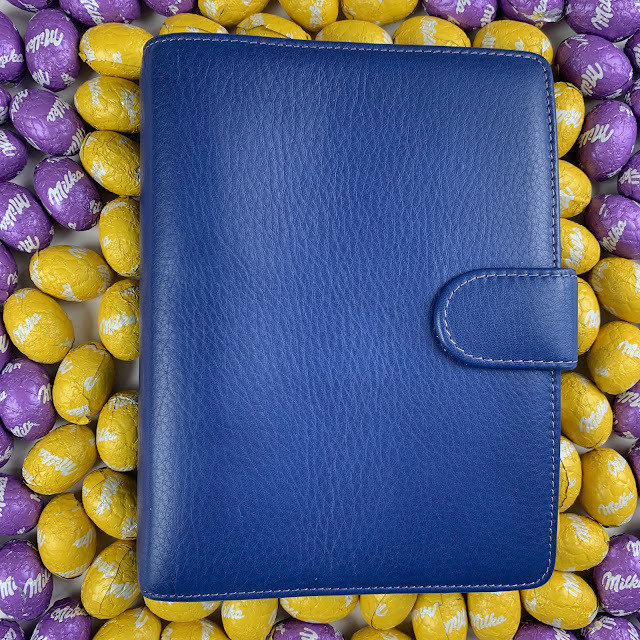 What is the most you have ever spent on a Filofax ? Which model? The "Spotlight" section, Webfinds, and Adspot. It's wonderful to visit a site that brings so many of us together, from places all around the world! Thank you Linda for agreeing to go under our spotlight. And if anyone else would like to take part in this series then please contact us at: philofaxy at gmail dot com Thank you. Filofax Flex Conversion - It's My Life! I would guess for a lot of people today might be their last day of work before the Christmas holiday, although I know some of you work weekends and possibly Monday Christmas Eve as well. In UK and other places 26th December is also a holiday, not here in France, it is a normal working day! I know when I was working these last few days before the holiday break were either mad crazy busy with lots of last minute work coming in to be signed off, reports to be peer reviewed to get them 'out the door' before the end of the year......... or deadly quiet, especially between Christmas and New Year, if it was the later I used to make good use of the time to up date my Filofax and get it all prepared for the start of the New Year. 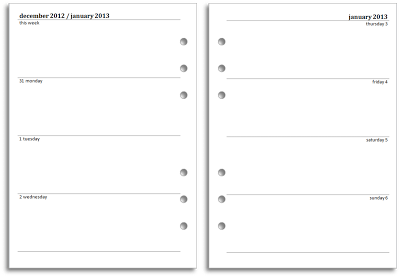 What routines do you go through with your Filofax to prepare it for the New Year? 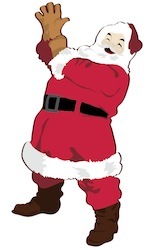 Christmas is just around the corner, but plans are in place for two meet ups in March 2013. These will be taking place in Manchester and London on March 9th and March 16th. I will be in UK for a couple of weeks so I have been able to adjust our travel dates so I get two Saturdays... got to get your priorities right?!!! So this is a 'calling notice' for people who would like to attend the either of Philofaxy Meet Ups in Manchester or London or both!. Please read all of the post before you apply for a place on the meet ups. Places are limited in numbers. The date of the meet up is Saturday 9 March 2013 and we will meet initially at 12 noon at BHS in Market Street. However, the actual arrangements for this meet up are fairly flexible, and we will tie down the more precise arrangements in the next few weeks once we have a list of people. We need to decide on where to eat and where to shop afterwards, so anyone who is local to Manchester and knows the City Centre well, we would appreciate your input. To get a place on the meet up you need to email: steve[at]philofaxy[dot]com and mark your email March 2013 Manchester Meetup but not before 8am (UK time) Saturday 22 December 2012. Please only request a place if you are 99% certain that you will be able to attend on the 9th I'm hoping this time to have full attendance. 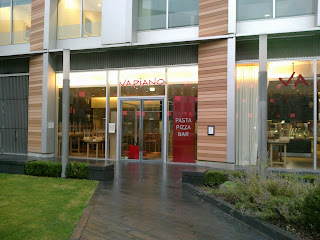 The date of the meet up is Saturday 16 March 2013 and we will meet initially at 12 noon at Vapiano on the corner of Southwark Street and Great Guildford Street on the South Bank of the Thames, this is behind Tate Modern on Southwark Street about a 10 minute walk from either London Bridge Station or Southwark Tube Station. During the meal there will be plenty of time for chatting and sharing Filofax organisers... There is also a large lounge area were we can sit and drink coffee or something stronger. Then we will take a walk across the river to City Organiser who have kindly agreed to open their shop for us on the Saturday afternoon... in fact Andy will hopefully be joining us for lunch at Vapiano. To get a place on the meet up you need to email: steve[at]philofaxy[dot]com and mark your email March 2013 London Meetup but not before 8am (UK time) Saturday 22 December 2012. Please only request a place if you are 99% certain that you will be able to attend on the 16th I'm hoping this time to have full attendance. Once all twelve places are assigned additional names will be added to a reserve list, in case anyone has to drop out of the meet up. Should you be unsuccessful in booking a place on this particular meet up in March there will be another meet up in spring/summer 2013 the dates are as yet to be confirmed. If you are staying over night there are a variety of hotels in the area, Premier Inn, Travel Lodge, Holiday Inn Express, Mercure all have hotels in the area. I will be staying down in Kent so I will be coming up for the day, but I'm sure if people want to meet up afterwards for a meal like the recent London Meet Up, then I can stay late in to the evening as well. I don't know what it is about Filofaxes as I'm not particularly fickle when it comes to my other belongings. Maybe it's the ol' search for the perfect planner or just downright envy... I'm not sure. I immediately loved the Ascot I purchased from Adspot, and said to myself, "Right, that's it and I am finally done, and the only reason I will replace this is if it falls apart". And then the little doubts started to creep in when I was deleting some old photos and came across ones of my first crimson personal Malden. I originally obsessed about them for a long time, but wouldn't buy one as I already had a perfectly decent binder, a cherry Classic. And somehow I still wasn't content when Filofax kindly replaced the faulty Classic with my long sought-after crimson! My journey took me then to an A5 in vintage pink (sold the crimson one, silly me) and a personal in purple, but sadly both were faulty and were returned. I took this as a cue to investigate others rather than immediately returning to Malden, and sampled the delights of a slimline and the Ascot. However, deep down I think I knew where my loyalties still lay. I hadn't really made my mind up, but wrote an update in the Philofaxy Facebook group which was me just thinking out aloud that my ideal solution would be a swap and the lovely Kate stepped forward! Once the decision was made we both sprung into action and posted the filos, and I had my Malden in my hands the very next day! On opening the box, I just went, "Ohhh!" and gazed at its loveliness. I am so relieved to be a member again of the Malden Appreciation Society (as the wonderful Tony put it), and I'm not going to let this one get away! I haven't really done any work on its set up other than plonking the contents of the Ascot straight in, but I already feel right at home. I admit to one little eBay purchase to make me smile and make it feel more mine, which I've attached to the zip pull inside. It originally had a little bell on the bottom, but my cat was much too interested and I think the noise would've got on my nerves eventually. 1. In the few weeks since the meeting held in November, Filofax and myself have been able to establish good lines of communication between the Marketing Department and Philofaxy with additional input in to the New Product Development Team as well. However, it is very early days yet as we have been discovering more and more about each other beyond the very quick overviews we gave at the meeting. Since then we have been looking in detail about the various aspects of the blog and all the other places we both exist in. Additionally we are waiting for the new PR company to come on stream and I’m told they are looking forward to working with us at Philofaxy on product sampling/reviews and blog outreach. I believe too that we will be added to the media press release list so will automatically receive announcements at the same time as the media. I think this is very encouraging. 2. I have given some small hints and tips to help Filofax with their presence on Facebook, so they can now respond to readers and Filofax users in a more corporate manner and hopefully this will improve relations with our readers as well I’m sure. 3. 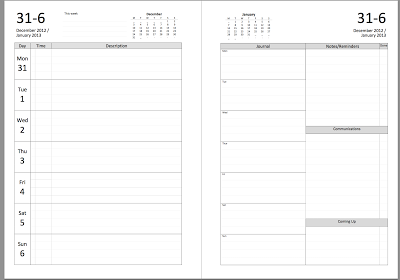 One of the requests presented to Filofax at the meeting was for the tabbed monthly inserts to be changed so that the months were not printed back to back. As you will know if you have used these inserts, with them printed back-to-back you are unable to separate the months to be able to archive them or to interleave them with weekly or daily inserts. 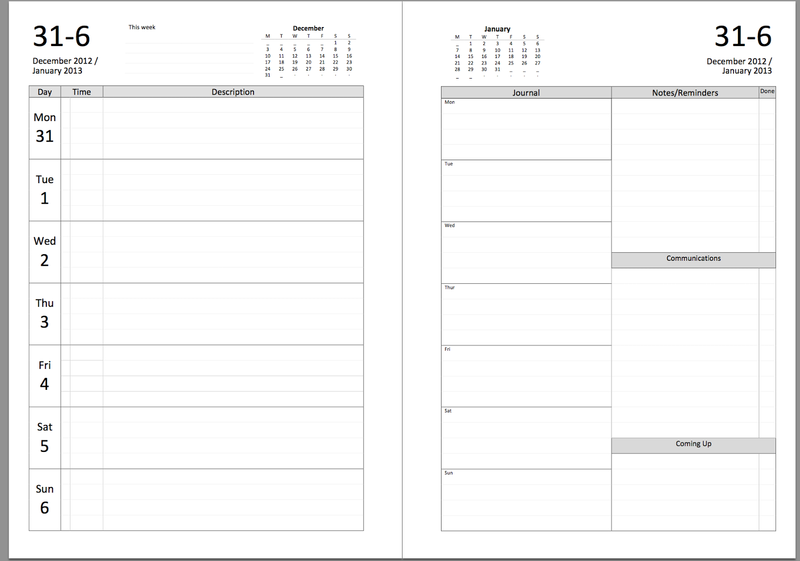 I have sent Filofax some mocked up prototype inserts in a design that would solve this issue and allow people to separate the months in their organisers. These prototypes have helped the team at Filofax to better understand the issues with the current inserts and how the proposed changes improve on the use of this particular set of inserts. Filofax are now putting these new inserts through their formal product assessment process to see if they could become part of the range or not. The change to the inserts has an obvious increase in production costs, so like any other change it has to go through a process to validate the impact on costs and the retail price of the product. 4. As a direct result of Philofaxy posts and comments, Filofax have also commenced an internal review of paper quality. As part of this they are looking at other paper on the market for consumers. I have been informed this is an internal business process review and not a study that will be made public. It is encouraging that they have heard the comparisons being made and are investigating. 5. 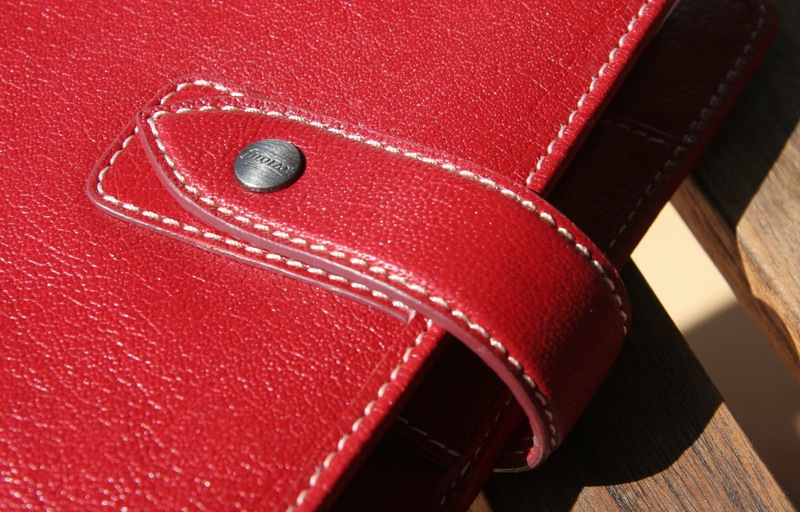 I have been told that the 2014 diary inserts are already in production, many already printed. Filofax is a global business, producing diaries for 40 plus markets around the world and as such they work with considerably long production lead times. So any new paper will not be incorporated widely for some time. However, the Filofax Enthusiasts range that will be launched in 2013, which was spoken about at the meeting, could be printed on different paper stock, hopefully paper of higher quality. We will be told about this new range in the New Year. The production of all of their products and the distribution of them is spread through out the year so there isn’t a huge peak in the demand on their distribution channels at the beginning of each year. 6. Whilst Filofax acknowledged the problems with the existing website at the meeting. We were told about a new improved website that will be launched in 2013. From discussions between Filofax and myself, I have put forward a couple of ideas to improve the descriptions of the organiser products on the website and these suggestions have been very well received by the team. I’m hoping to meet up with the team at Burgess Hill when I’m over in UK in March, but a date has yet to be arranged/confirmed. I hope you are happy with this update, I can’t promise to have updates on a very frequent basis, but I will try to up date you when there is something of significance to report. What I would also like to add is that I am very grateful for the time and effort that Filofax have put in to be able to respond to my calls and emails in the last few weeks – all of which have been responded to same day. 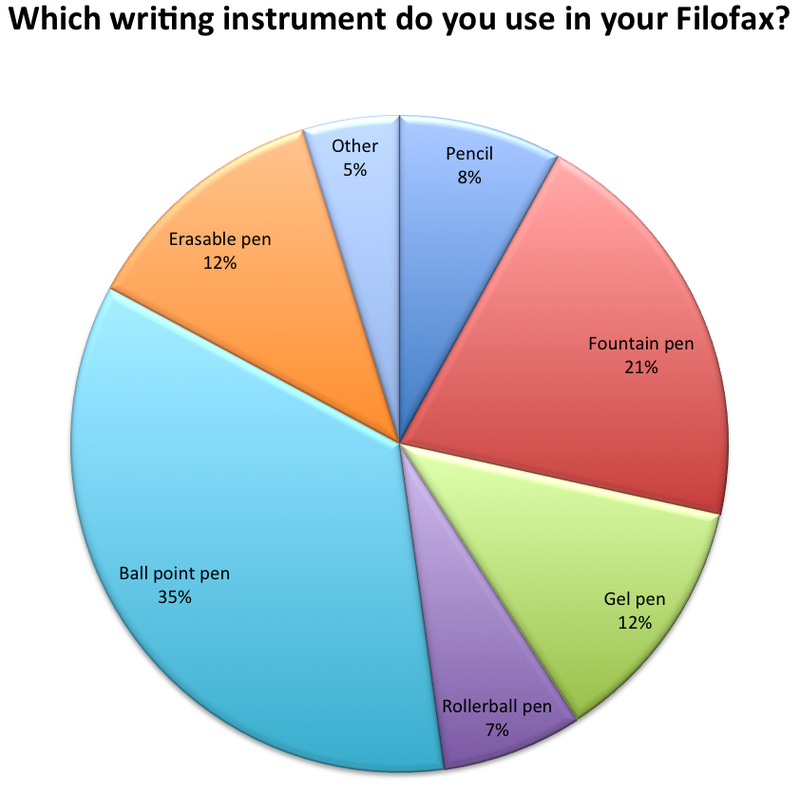 Thank you to everyone that took part in our 'Pen' poll, as you can see from the results the ballpoint pen remains a popular writing instrument for most people. Not far behind is the fountain pen. Obviously the ballpoint will write on any paper without any bleed-through issues, they are very portable, the refills last months sometimes longer. The fountain pen is a little more tricky, I've certainly had them leak in the past. 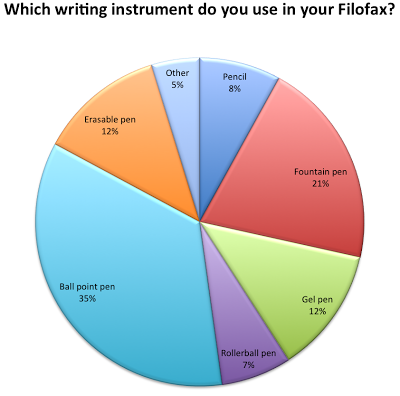 But of more concern to Filofax users is their performance with the currently available paper. Filofax 'coloured' 70 gsm - No bleed through, it performed even better than the white paper and I was quite surprised at this, but I will come back to this paper in a moment. Filofax Cotton Cream - Excellent with my sample fountain pens, although the ink did take longer to dry on this paper. Datacopy 80 gsm copier paper - No bleed-through issues, but the ink did feather a little. 'Bristol' paper, although this is in excess of 100 gsm, no bleed through and no feathering, it even performs well with solvent heavy CD marker pen without bleeding through! But you won't get many pages of this weight in to a Filofax. So only a small sample, but then I remembered back to the meeting in November with Filofax, the coloured Filofax paper isn't dyed, but printed, so the colouring might be acting as a further barrier to the wet fountain pen ink? I jotted this down then promptly forgot about it until I saw a You Tube video at the weekend and the person on the video made a similar comment that the coloured paper performs better than the thin white Filofax paper, it jogged my memory. The realm of 'Fountain Pen Friendly' paper is quite a difficult problem to solve. The paper has to not absorb the ink too much, yet it has to be receptive to it so that the ink dries quickly on the paper, this is particularly important for left handed users if they are going to avoid smudging what they have just written with their own hand. My tests weren't exactly scientifically performed or conclusive but having seen others make similar observations I don't think they are too far wrong. The performance of the thin paper might vary with the type of ink used? But the coloured Filofax paper was the surprise of this test. Have you tried different ink on different papers to see if it makes a difference? Please see the message below from Kate about a Meet Up in the New Year. I am starting to plan a meet-up in the South-West of the UK for early 2013. It is in the very early stages of planning, but so far I am thinking of it taking place in Exeter (Devon) city centre at some point in January! If you are interested in coming, or have any suggestions for places to visit, please email me (Kate B a.k.a. TPS) on bernasconiray at hotmail dot com! Thanks, looking forward to seeing you! The more the merrier!" Today I would like to introduce you to Patty. I've been married 31 years to my husband, David, and we have two grown married children. My son and his wife have the grandkids and they live across the street - yeah for me! David and I like to buy old, disgusting houses and turn them into something beautiful. No house is to awful for us. One of the houses we bought was filled with mice - we caught 24 in the first two weeks. Our current home had snakes! We had 3 in the family room and 7 in the laundry room in the basement. I wasn't thrilled about that - it almost made me want to hang up my remodeler hat! I bought my first Filofax in August of this year. It was a Personal Vintage Pink Malden. I've used Franklin Covey since 1993. I've dabbled with Day Timer and Planner Pad but I've always ended up back with Franklin Covey. After all those years with Franklin Covey, I'm ready for a change so I'm trying Filofax. I really like the Personal Malden. The leather is so soft and beautiful. I just got a Personal Holborn in brown. I use it for my daily planning, journaling (on the daily page) and keeping track of information. I also use it for my blog although I'm tentatively planning to have all my blog information in the Holborn and the rest of my life in the Malden. I've never used two planners before so I'll have to see how it goes. I'm really a one planner kind of girl. Most. Well, I'm not sure I can narrow it down to "most". I like the binder selection. There are SO many that I like. With Franklin Covey, it always took a lot of waiting to find one that suited me but there are a bunch of Filofaxes that I like. 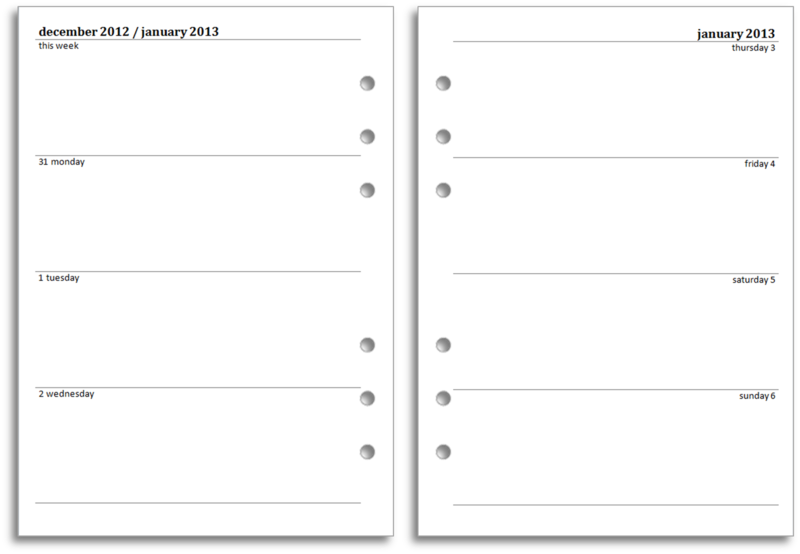 I like the plain planning pages. I'm easily distracted so less is better. I always bought the plainest of the Franklin Covey pages. I also like that on the 2ppd there are 10 boxes for to-do's. Sometimes I get overwhelmed making a to do list so I limit my list to just 10 items. It helps me prioritize better and think about what really needs done. When I saw that the 2ppd had 10 boxes, it seemed meant to be. It would have 2 pen loops and they would be big enough to hold any pen (that's my only complaint about the Malden - my pen won't fit in the loop). It would also have slightly bigger rings. It sits on my desk or kitchen countertop at home. When I'm out, it's in my purse. I'd kind of like to have a Metropol. I'm a bit of a binder snob in that I really only love leather. But I like the fact that the Metropol has two pen loops and some of the colors are gorgeous! It just looks fun. I'm trying not to buy it but I may succumb. The Personal Malden was $70. Ouch! I love being around like-minded people. Most of my friends and family don't really care about planners. I was really excited when I discovered that there were a whole bunch of people out there who loved planners, too. You know, I don't listen to music much. I have ADHD and music is a distraction. So I don't listen. I like silence! However, I am going to get some children's music for my grandkids. They love music and I don't have any for them to listen to. I'll probably get some Veggie Tales as soon as I figure out how to do it. No matter what the weather or which holiday traditions you follow, this time of year brings a particular focus on...food! Do you use your Filofax to store your recipe collection, list dishes you want to try cooking someday, or jot down wine tasting notes? I'm guilty of the last two especially, much to the amusement of my tablemates. 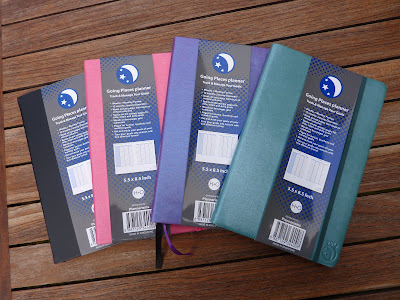 Personal size Filofax organisers come in four different size variations. I thought it would be interesting to compare them together. Slimlines are availabe in 11 or 13mm ring size. Zipped Personals come with either regular 23 mm or jumbo 30 mm ring sizes. To show how they all vary I did a short video with a comparison between a selection of personal size organisers. 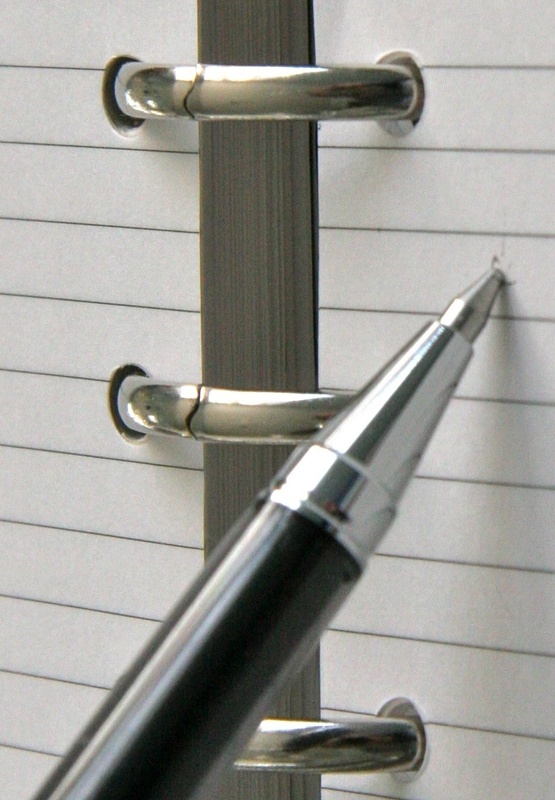 The advantage of having different sizes in the same paper size of course that you can choose the right size of organiser for the amount of paper you are carrying. For instance during my recent trip back to UK I needed to add things like maps of London, a London Tube map, things I obviously don't normally need over here in France! So I swapped from my compact Malden in to a regular Personal Malden, I've now swapped back in to the compact. So if you are a personal size Filofax user, which size suits you best? I've had several people tell me they are interested in my Plannerisms planners, but they are so attached to their Filofax they can't imagine leaving it for a bound planner. The good news is, you don't have to! Here are some ideas on how to use the Plannerisms planner along with your Filofax. 1. 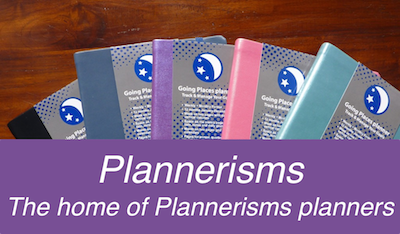 Use the Plannerisms planner as a Goals Workbook/ Journal and your Filofax as your planner/ diary. Recently on Plannerisms I wrote a long and detailed post on how to use your Plannerisms planner as your Goals Workbook/ Journal (which you can click here to see). In that post I show you all the different types of Goals pages and give you suggestions and ideas on how to use them. I designed the Plannerisms planners with lots of pages for your Annual, Quarterly, Monthly and Daily goals. You can easily use it as a designated workbook/ journal for all your goals, separate from your actual planner if you like. You can click here to see a video I made showing all the Goals pages and more ideas on different ways to use them. 2. Use the Plannerisms planner as your weekly planner and your Filofax as your daily planner/ diary and/ or information book (as I do). I use 2 pages per day Franklin Covey inserts in my personal Malden Filofax to plan and record today only (click here for more details on how I use these). This gives me a thorough record of each day. I use my Plannerisms planner (currently self-drawn, switching to the new printed ones in January!) for all future planning and goal setting. I've been using a weekly planner plus a day per page planner for nearly two years now. This system works great for me as an excellent combination of planning overviews and plenty of space for daily recording. I did a detailed post on different ways to use the Plannerisms weekly pages, which you can click here to see. So what's it like to carry two books? The Plannerisms planner pages are approximately A5 size, 5 1/2 by 8 1/2 inches but the book itself is much (much!) slimmer (at only 1/2 inch thick) and lighter than an A5 Filofax binder. When I use my Plannerisms planner along with a smaller Filofax as my information book and daily diary, the two books together are smaller and lighter than one A5 Filofax, yet I get the nice big weekly pages. Plus I like to be able to see my week in my Plannerisms planner open alongside my day in my Filofax for the daily details with the weekly overview to see what's coming up. 3. Use the Plannerisms planner as your household routines/ cleaning/ maintenance/ finances book. This is a great use for the Plannerisms planner if you want it to stay home. Use the monthly and weekly pages for your housecleaning rountines, FlyLady Zone work, home maintenance schedules, gardening, and anything else that needs done around the house. It's also great as a financial/ bills tracker. Use the Monthly calendars to track bills due and paid, write financial details and totals in the lined pages between each month, and tuck unpaid bills in to the back pocket so they don't get lost. So you see, there's no need to abandon your Filofax to try out the new Plannerisms system! With Plannerisms and your Filofax you can have the best of both worlds, rings and bound. For loads more photos of the Plannerisms planners Goals pages and other features, click here for my detailed Plannerisms planner post and click here for my video overview of the Plannerisms planners. 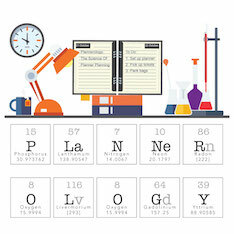 Click here for the Plannerisms planners ordering page! I think people must be busy writing Christmas cards instead of Filofax blog posts!! !.